The weak results of the New Movement-Meretz in Tuesday's elections led party supporters to call for introspection and self-examination. Meretz sources have aimed their criticism mainly at the controversial union with the new left movement led by Chairman Chaim Oron (Jumes). The disappointment on the faces of Meretz party members Tuesday turned quickly to shock on Wednesday morning when it became clear that the party sank to an unprecedented slump of only three seats. Contributing in large part to their astonishment is the fact that MK Zahava Gal-On will not be sitting in the next Knesset. Even though she was already covering up her disappointment on Tuesday night, even refusing to issue a response to the elections results, those around her could not help but take note of her shock and astonishment. Gal-On, known for speaking her mind and for vocally opposing Meretz's election strategy, surely will not stay quiet for long. Her associates said Wednesday morning, "She has a lot to say. We are still waiting for the final vote count. There are more seats that are supposed to be divided between the parties. Maybe Meretz can still get four seats. There is no doubt that no one ever thought that Zahava could be out of the Knesset." Gal-On's associates recounted that during the negotiations with the New Movement, when polls were predicting that the party would win at least 10 seats, Gal-On was the one to volunteer her third spot on the party list as a gesture of respect for Nitzan Horowitz. Some Meretz members said Wednesday that it is not out of the question that a reshuffling could take place in light of the election results in order to get Gal-On into the Knesset, perhaps by asking that Horowitz evacuate his seat for her. A short time after the exit polls were published, Oron took the stage in order to take responsibility for the disappointing results. At this point, polls were still predicting fpir seats for his party. The real results subtracted a seat from Tuesday's upsetting result. Oron's associates reported that he has no intention of stepping down from his post as head of the party. 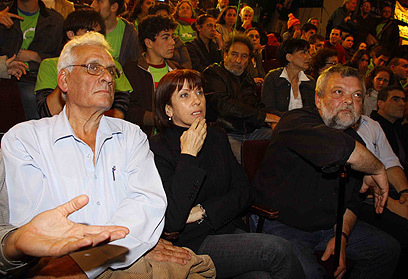 Meretz members will convene on Sunday to discuss the party's new circumstances. Meretz stuttering response to Operation Cast Lead invoked internal party criticism. MK Gal-On said on the subject, "My opinion was different than that of most party members. Because Meretz is an ideological party, it must have a clear statement even in such a situation." However, most of the anger about the party's poor results is being directed at the unification with the New Movement. Not only did the joint cooperation not help Meretz, but the party was left with some of its senior party members without a Knesset seat while Nitzan Horowitz benefited. Some in Meretz said even before the elections that the joint effort between Meretz and the New Movement would not bear fruit. Oron himself heard such criticisms as party members watched the election results Tuesday in Tel Aviv, and promised, "We will thoroughly examine what happened. It is clear that the connection did not work. We need to look into what happened and what were the reasons for it." See all talkbacks "Meretz shock: Gal-On not in Knesset"